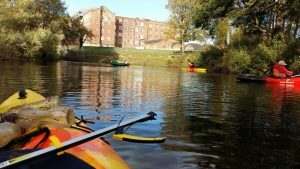 A group of seven paddlers from Midland Canoe Club and Derbyshire Wildlife Trust took part in a clean-up of the River Derwent in Derby. 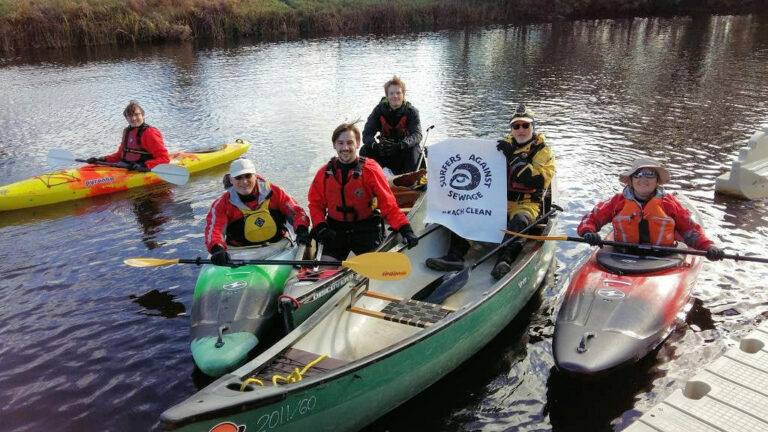 Club members Ben Seal, Clare Byram, Glen Byram, and John Chamberlin, and Dr Scott McKenzie, Alex Page and Henry Richards took to the water in four kayaks and two open canoes for the exercise. 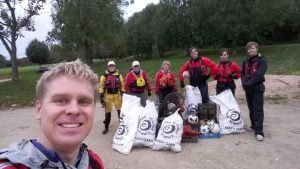 The aim initially was to start at Darley Abbey and clean the Derwent of litter, from the club site down to Alvaston Park. But by the time they had reached the Silk Mill they had already already filled their available ‘SAS’ sacks, and the open canoes too, and since that had taken longer than expected Ben suggested that postponing the lower section below the city weir to another day. Carrying their kayaks and canoes the weir in Derby’s Riverside Gardens they paddled down to Alvaston to unload the rubbish and place it as agreed with Derby City Council near one of the bins, arriving back at the club in the dark. 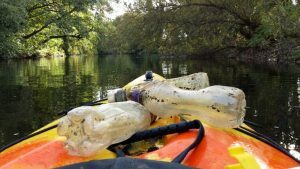 The haul of mainly bottles, but also drinks containers and food trays added up to 134 items of single use plastic but at least the same number again of other items, including bottles, tin cans and footballs. John said: “This was a worthwhile community exercise but it’s sad that so many people had discarded their litter in the river, using the Derwent as a dustbin when they all have them at home.